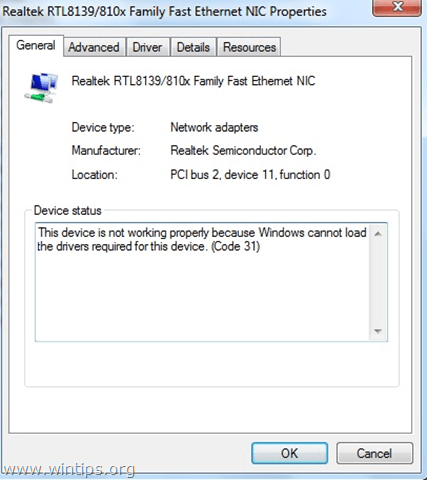 How to Fix Network Adapter Code 31 error (Device is not working properly). "This device is not working properly because Windows cannot load the drivers required for this device. (Code 31)". When the Code 31 error occurs in one (or more) device(s), then the corresponding device appears with a yellow exclamation mark sign, next to it, in Device Manager. In several cases the Ethernet "Code 31" error, can occur despite the fact that the correct driver of the Ethernet controller is already installed. At these cases you have to perform some additional steps to resolve the error code 31 in your Network Adapter. This tutorial contains detailed steps and instructions on how to resolve Ethernet Controller Code 31 error in Device Manager. 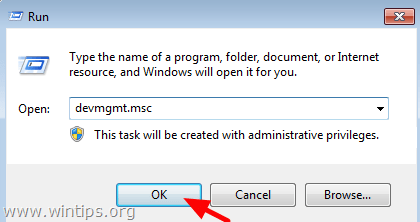 How to Fix the Network Controller Code 31 error in Device Manager. Solution 1. Install the latest driver for Network Controller to fix the Network Adapter Code 31 error. Step 1. Download the latest Network Adapter Drivers. 1. From another computer, navigate to your computer's manufacturer support site (if you own a branded PC or laptop) or to the motherboard's support site (for onboard network adapters) and download the latest driver version for the Network Controller. After the download, copy the driver to a USB drive and then transfer the downloaded driver to the problematic computer. Step 2. Install Ethernet Adapter Drivers. 1. Follow the manufacturer's instructions to install the downloaded Ethernet adapter driver on your computer. 2. Check if your Ethernet Controller is working properly. If Code 31 error is still displayed in Device Manager, then proceed to Solution 2. Solution 2. Remove Invalid Registry keys & re-install LAN Adapter drivers to resolve the Code 31 error in Network Adapter. Step 1. Open Registry Editor & Backup Registry. 1. Simultaneously press the “Win” + “R” keys to load the Run dialog box. 2. Type regedit and press Enter to open Registry Editor. From the main menu, go to File & select Export. Specify a destination location (e.g. 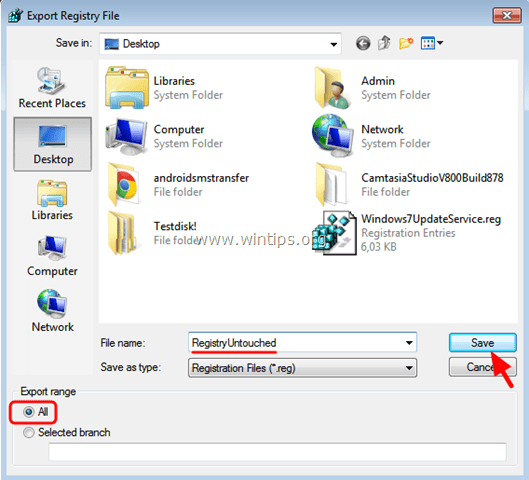 your Desktop), give a filename to the exported registry file (e.g. “RegistryUntouched”), select at Export range: All and press Save. Step 2. Delete invalid registry keys. Step 2. Uninstall the Network Adapter from Device Manager. * Note: If asked, do not remove the driver files from the system. It is not necessary. * Note: If Windows cannot find the appropriate driver for the Ethernet Controller or if you have deleted the driver during uninstall then you have to download and install the latest driver version for your Network Adapter from the manufacturer's support site. « How to fix: Volume, Clock, Power or Network icon(s) Missing & Check Box options are Grayed Out on Windows 7 or Vista. » How to create a bootable Windows 10 USB installation media. OMG. Thanks a ton. After 3 days without network… Trying everything except fresh OS … Just deleting the registry worked … I still can't believe it… Oh.. The horror… God bless you. Nice post but MAKE SURE someone didn't disable booting from a NIC card in the F2 bios setup (Dell PC) and then disable the onboard NIC card by accident. my issue was not with ethernet, but a Netgear adapter. I purchased a newer one on the recommendation of a netgear person but when I uninstalled the old one and attempted to install the new one – It wouldn't install so that started the whole nightmare. uninstalled and reinstalled with no luck. couldn't get restore to get back to a time when the older one worked. still stuck. having to use my win10 laptop just to try and get answers. not sure if I should try to reinstall the older one after following this thread or reinstall the newer one….? (Win7Pro 64 bit) netgear WNA1100 (older) Netgear 600 A6100 is the newer one. I tried step 2 of the fix your Ethernet problem and removed the config entry in the registry, uninstalled the Ethernet driver and rebooted allowing windows to repair the problem and when it booted back up the driver was installed properly and the problem was solved and as a bonus the red X was gone. These steps not working on my windows 7 laptop. The adaptors cannot be uninstalled either. Installed latest drivers for the adapter not solving the problem too. The system is not having any previous restore point saved either thus cannot even roll back. My problems started after sudden power failure and computer booted once with blue screen. After successful normal boot I'm stuck with no network problems. Both wired LAN and wifi cannot be used. @Steven Soosai: Try the Methods 5 & 6 from this guide to fix Windows problems. Try both solution its still not working both the nfForce networking controller and Broadcom wireless 802.11b/g WLang are shown with the yellow ! under unknown on the Device Manager. Windwows has determined the driver software for your device is up to date and the best driver is already installed. @Brian: First of all make sure that your system is virus free. Then remove any antivirus/firewall software if installed and reapply the solutions mentioned on the article. If the problems persists, then restore your system to a previous working state. Wow, well done kind sir! I can't really thank you enough! You saved me !!! Very good tips thourough and easy to apply! Solution 2 worked without any issue. Thanks a lot ! I was struggling for more than 2 days with error 31 after having uninstalled Zonealarm. Great stuff ! after doing this my net work card started running but my keyboard and mouse not working. @Karth: Unplug and then re-plug your mouse and keyboard. Any success with win 10?? I am using TP-LINK TL-WN725N Wireless Network Adapter for Windows 10. This adapter is now working properly. Does anyone know how to solve this problem. @Rosa Andreas: If the Wireless Adapter is working properly, what it the problem? Yeah, that is the problem the program worked with 7 but when I upgrade to 10 it would not work. I think 7 was too old to upgrade. @fredadcock: Windows 7 is the more reliable Microsoft OS out there (today). At your case: Perform a Windows 10 repair install. @fred adcock: The article is written for Win7. I don't know if the instructions work ιn Win10. Thank you a lot, solved with solution 1! You are a genius after digging the internet for days, i finally found my savior.. When I follow solution 2, I cannot find config value in network folder. There are only Default and FilterClasses. I followed solution 1 but I can't correct my error. @Nadeeshani: Maybe the adapter is damaged. Try to remove it and put it back again or try with a different adapter. Well written tutorial. I recently got this issue but I've still not found an easy-to-follow tutorial as to how I may fix this. This pointed me in the right direction; however it's still not fixed for me.. I have a ASUS usb-n53 wireless adapter. When I uninstall the drivers, all I have to do is disconnect the usb from my computer and plug it back in and the driver is back. I'm not even sure it re-installs the driver because as soon as I plug it in it's back in device manager instantly, and there's no box that pops up when installing the driver, so idk..
Do you think it might help to manually delete the driver and re-install them from a usb disc? if so, how do I do this. @Andreas: Check in Program & features (from Control Panel) and uninstall the WiFi driver from there. If there isn't a program for your WiFi adapter there, 1. download latest driver for your Wireless adapter. 2. Then right-click on WiFi adapter (in device manager) > Properties and at Driver tab select Update Driver and use the downloaded driver to install the WiFi adapter.